So, today is a good day! On December 30, 2004 I married my wonderful husband. Here we are, six years later! We've had some rough times but we have stuck through them and the good times make everything worth it. I love my husband so very much, and I am so glad we are able to share our lives together. Four years ago today our son, Gabriel, decided to join us! 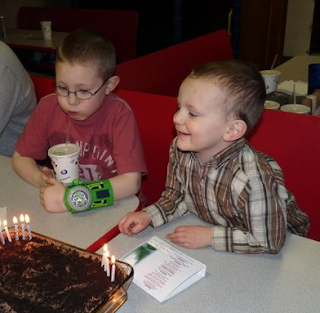 Gavin also celebrated his 7th birthday recently (on the 26th!). My babies are all growin up and gettin so big! Gabriel made quite the entrance four years ago! I went into labor at 9am, I arrived at the hospital at 12:15pm and he was born at 12:27pm. That's right, I was only in the hospital for 12 minutes before he was born! Laboring in a car is NOT fun...but at least I didn't deliver in the car as well. He was our very special anniversary gift! So, today is a happy day! Oh my gosh! What a story! Congratualations Jenilee! Thats definately something you will remember for the rest of your life! My favorite song lyric right now is "lifes not the breaths you take, but the moments that take your breath away!" Heres to many more HAPPY years! What a cool anniversary gift! I'm a new follower and would love for you to follow me back! I am your newest follower via the blog hops! Congratulations on everything! Thanks for linking your blog up to my blog hop on Harvest For Tomorrow! I am your newest follower! I can so relate to the laboring in the car. My 4th son was born 20 min. after getting to the hospital. I had to drive myself and older 3 sons for about 20 min. while having contractions 3 min. apart. My mom met me half way and drove me the remaining 25 min. Crazy time! Found you on the Swinging By Sunday blog hop. I have 5 boys. You can visit me at www.raisingknights.com.